You will be met by our representative inside the Jordanian terminal of Arava Border. 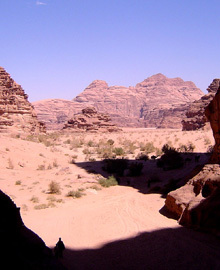 Then drive 45 minutes to Wadi Rum, one of the most impressing desert landscapes in the world. You will enjoy a jeep ride to the sand dunes, Khazali canyon, see Nabatean inscriptions and a rock bridge. Afterwards we proceed 1.5 hours to Petra hotel. Overnight in Petra. Breakfast at your hotel, then you will be accompanied by your English speaking guide to explore the rose-red city Petra, comprising a complete urban infrastructure which includes temples, high places, public buildings, markets, theatres, reservoirs and cisterns. Its entrance, a one-kilometre long fissure through the towering cliffs, the Siq, provides a dramatic approach to the city. The narrow winding path through the canyon dramatically opens up to expose the Treasury. We go on to the Street of Facades, the Royal Tombs and Qasr Al Bint. In the afternoon 2.5 hours drive to Amman hotel. After breakfast short ride to Christian town of Madaba where we will visit St. George's Apostle Church, home to a stunning mosaic map of the ancient Middle East. 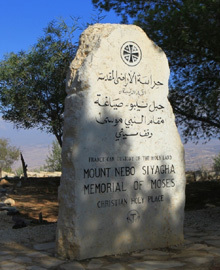 Continue to nearby Mount Nebo, the alleged burial place of Prophet Moses. 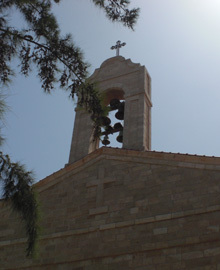 We visit the church on top of the hill and have a panorama view over the Promised Land. 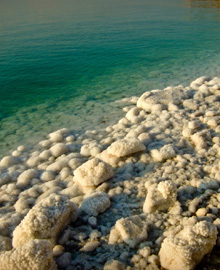 At the lowest point on earth, the Dead Sea beach, you have free time. Overnight Amman hotel. Breakfast, latest check out 12:00, according to departure time transfer to Amman Airport to say farewell. 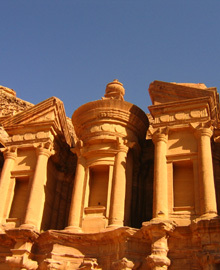 ● 1x hotel accommodation with breakfast in Petra. ● 2x hotel accommodation with breakfast in Amman. ● Circa 3 hrs jeep tour Wadi Rum with Bedouin driver. ● Entry visa Jordan 40 JD = 60 USD per person.